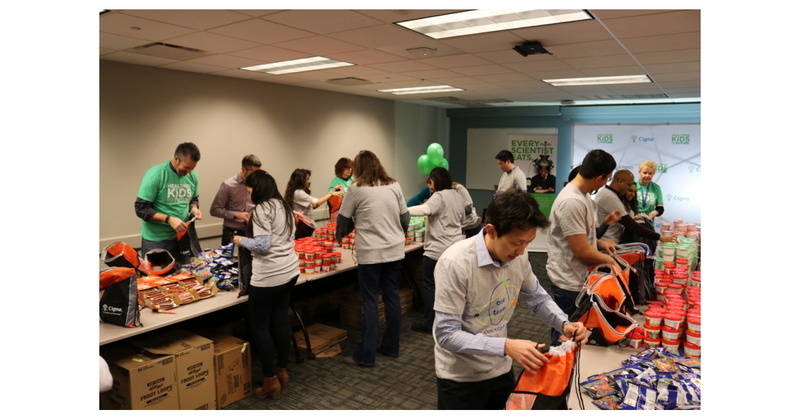 FRANKLIN LAKES, N.J. & BRONX, N.Y.–(BUSINESS WIRE)–A photo is available on Business Wire's website and the Associated Press photo network of employees at the Express Scripts office in Franklin Lakes, N.J. celebrating the company’s combination with Cigna by filling backpacks with food for children at Public School 20 in the Bronx, New York. The event marked the beginning of a new global $25 million program, Healthier Kids for Our Future, and demonstrated the newly combined company’s commitment to communities. The local event was part of a nationwide Cigna initiative that is the largest-ever in Blessings in a Backpack’s 10-Year history.